Last night was another of what I like to call KB's party nights. When he wakes up at about 11pm and wants to party and wants us to party with him. Yada yada yada I'm really tired today. I'm on my way to work and while I usually enjoy my choice of seating options on the #86 at this hour, for some reason this sardine can is packed. I feel a little hard done by. I was really looking forward to a little micronap but I can't do that standing up, can I? I'm not Phar Lap! I feel like if these people knew how little sleep I'd had then they'd agree I need the seat. If only there was a way of silently communicating to the world how difficult your personal circumstances are, so the seats can be given to the most deserving. I guess there are faces. Those things provide an indication of what's going down. Looking at the faces I have to admit that maybe I'm not the most deserving person. Though it's hard to tell what with everyone looking down at their phones. 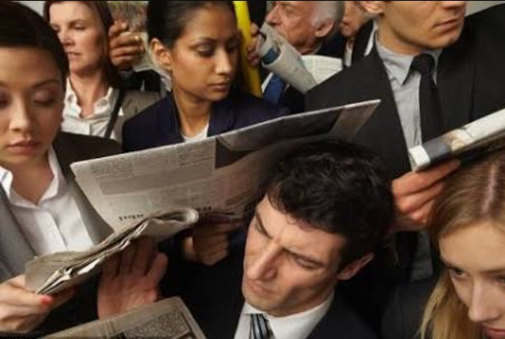 Replace those papers with phones and you've got my commute! I can't tell if I deserve a seat more than my brothers and sisters on the #86. But boy do I want one.